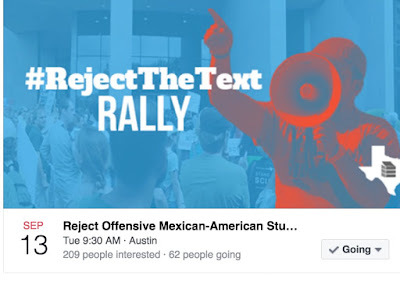 This rally invitation regards the controversial textbook authored by Jaime Riddle and Valarie Angle titled, "Mexican American Heritage," that will get considered for adoption by Texas' State Board of Education (SBOE) in their September meeting, with a vote taking place at their November meeting. The rally takes place on Tuesday, September 13th at 9:30AM in Austin, Texas at the William B. Travis Building, 1701 North Congress. Today, the Mexican American Legislative Caucus (MALC) and the Senate Hispanic Caucus issued a joint statement urging the SBOE to reject the Mexican American Heritage textbook. 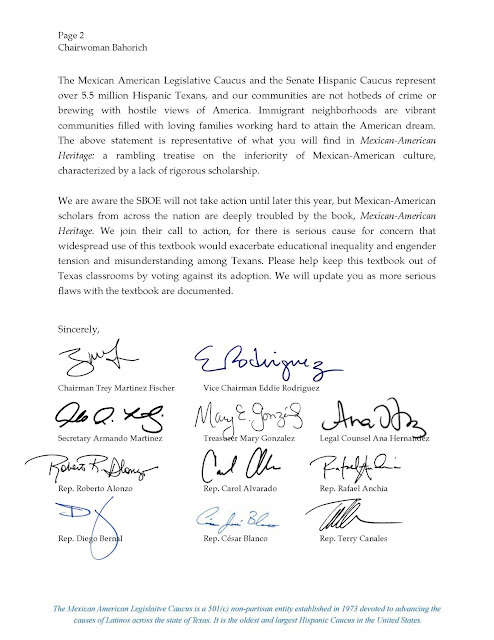 Here is the joint statement: https://www.facebook.com/TxSHC/photos/a.226038840829868.36511.225878577512561/820975221336224/. 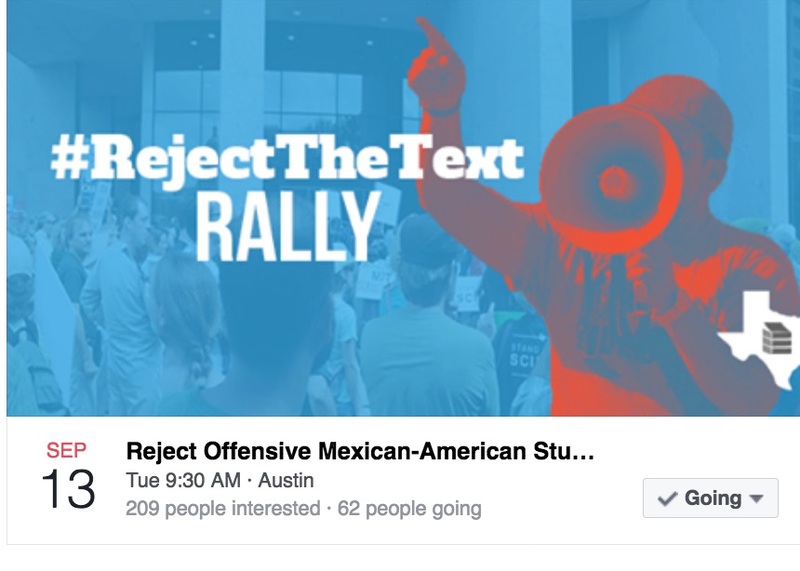 Also, here is the link to the Facebook event which announces the Sept. 13 rally and SBOE hearing and includes details: https://www.facebook.com/events/1827576007472052. Please share widely with your social media networks. For ease, I've gone ahead and posted (see below) the joint statement and full MALC letter referenced in Celina's message. It's great to have great leadership on such matters in Texas. Nearly a third of Texas teachers work a second job during the school year “to support themselves and their families,” according to a survey by the Texas State Teachers Association. “Although the weekend gives students a break from their classes and time to relax with their families, for many teachers Saturdays and Sundays are spent working at extra jobs and preparing for next week’s teaching duties,” said the group’s president Noel Candelaria. 86 percent of moonlighting teachers said they wanted to quit their extra jobs but would need a pay raise of about $9,000 to do so. I just read this fascinating piece on the legendary coyote. Thanks to Dr. Bernardo Gallegos for sharing. I hear the coyotes' howl sometimes near my home, especially late in the evening. They of course are fabled and storied creatures that are native to North America that Native Americans have always respectfully characterized and mythologized"as the trickster" because of its unrivaled wit and cunning in its quest to survive. In a recent book, Coyote America, Dan Flores, he examines coyotes' extraordinary evolutionary adaptability not only to changing environmental contexts, but literally to campaigns that have sought to exterminate them. I just looked up Coyotes in Central Texas from the Austin Animal Center. Among other things, they provide advice on how to get rid of them without hurting them. We have much to learn about our ancient friends whose howl, according to Dan Flores, is indeed "our original national anthem." 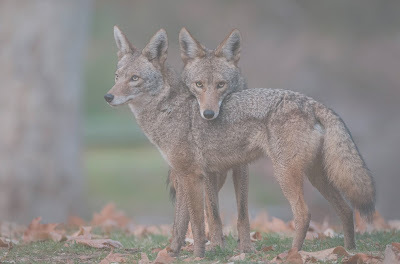 Coyotes, the victims of attempted extermination, have found a way to thrive. When National Geographic caught up with Flores by phone from his home in New Mexico, he explained how misunderstanding and prejudice have dogged the coyote’s history; how the cartoon character Wile E. Coyote helped change public attitudes; and why the coyote’s howl plays a unique role in maintaining populations. I was trying to figure out how American attitudes changed enough toward these animals in the 1960s and early 1970s to persuade Richard Nixon to issue a presidential proclamation that banned the further use of poisons on the public lands of the West. And I realized that pop culture had done a lot toward swaying the way Americans thought about coyotes. Project Coyote is one of a number of conservation organizations devoted to bringing back the coyote—tell us about these efforts and why it is important to save what you call an "American avatar." 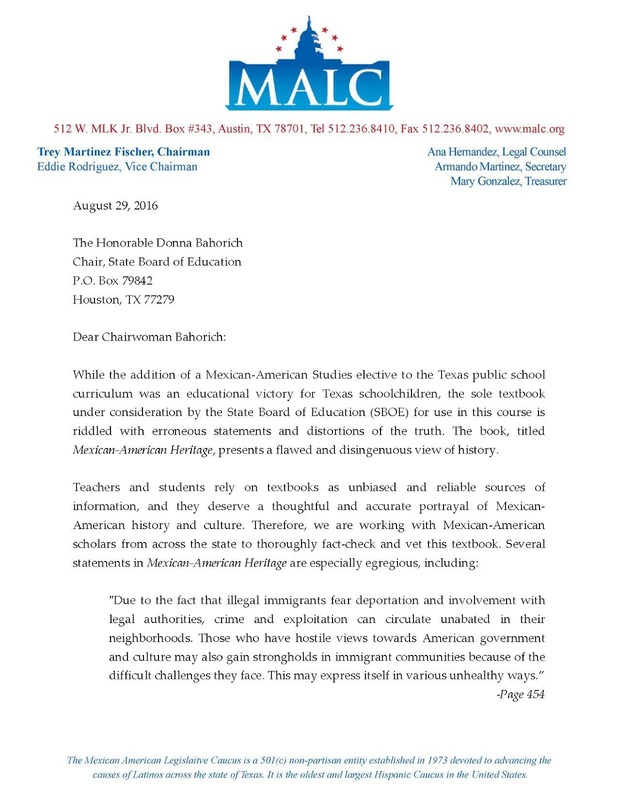 This comes from the Responsible Ethnic Studies Textbook Coalition that has formed surrounding the potential adoption of—by all accounts— a thoroughly and profoundly flawed and racist text, Mexican American Heritage, which is under current consideration by the Texas State Board of Education. What Coalition member, hubby, and UT History Professor extraordinaire, Dr. Emilio Zamora, did in pulling this together is exquisite. Consider sharing in this wonderful opportunity to impart wit, verse, and wisdom in Mexican American Studies. Instructions on the selection of excerpts or passages, as well as on criteria for consideration appear below. 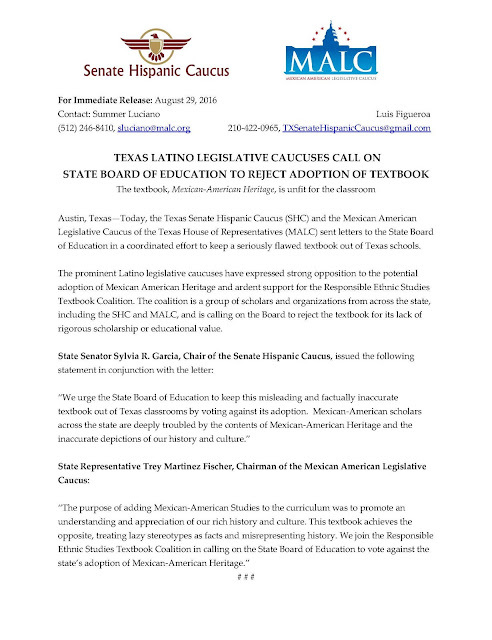 The Responsible Ethnic Studies Textbook Coalition is overseeing the preparation of critiques of a textbook entitled Mexican American Heritage to dissuade the Texas State Board of Education from adopting it for use in our public schools. Aside from pointing out the numerous factual errors, polemical tone and the recurring offensive statements, we accuse the authors of an obvious lack of familiarity with the vast Mexican American Studies literature published during the last forty years. To address this issue, we wish to initiate an electronic counter-story to help shift the paradigm on how we are seen and described. We're shifting the paradigm on how Mexican-Americans are seen and described. We wish to show the wit, verse and wisdom in Mexican American Studies to underscore the dismissal of Mexican history and challenge the flawed and stereotypical depictions in the proposed textbook. Simply put, we seek to demonstrate the wealth of rich and important information a textbook on Mexican Americans should include. We also want to give other like-minded persons an opportunity to join our fight over the production and dissemination of our collective knowledge. Do you have ideas for submissions? Please email Val Benavidez with any suggestions. Emilio Zamora, editor of the series, will fact check the entries and approve them for our series at the REST site. If you have questions, write to Emilio at e.zamora@austin.utexas.edu. How should I select excerpts or passages? Consult a book, article, speech or archival record and select a passage that you find interesting, instructive, insightful, beautiful and/or useful for teaching Mexican American Studies in high school, college and university classes. Also, please include a copy of an image associated with the author, book cover or event. If you are an author, we encourage you to submit parts of your publication(s) or other forms of creative work. What criteria should I observe? The passages should be brief—no longer than 20 lines of typescript—and should include their source. You may wish to include a very brief introductory statement—from one to three sentences—in which you explain why the passage is important for an understanding of Mexicans in the United States. We prefer quotes but will entertain other forms of submissions like recollections of historical experiences and art work. We will also accept multiple passages from the same source. 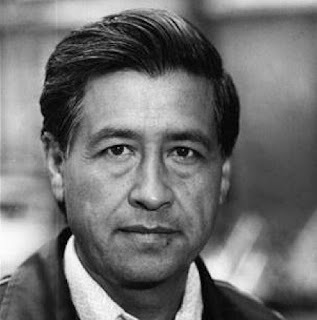 For instance, someone may wish to submit another quote from the life of Cesar Chavez (see below). Have you signed the petition yet? 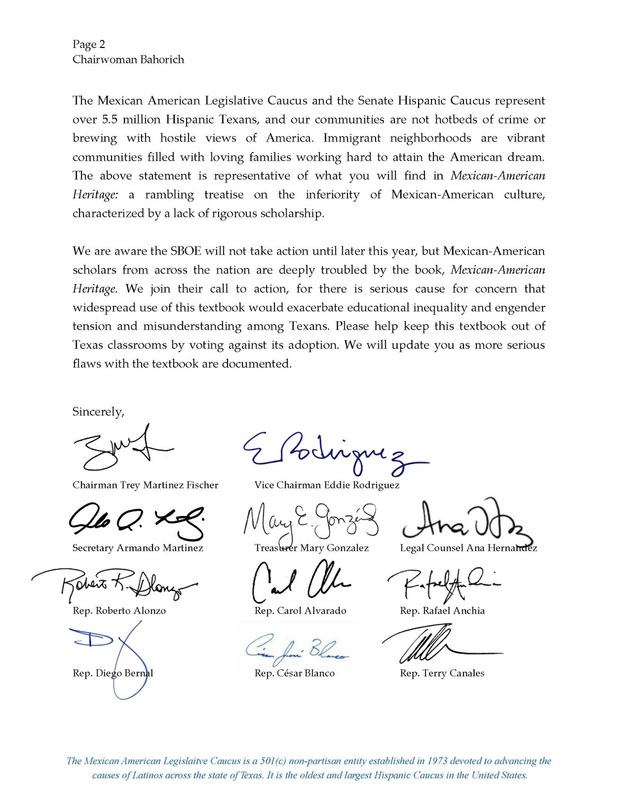 Add your name at MASforTexas.org. Excellent presentation by Dr. Wayne Wright on the federal Every Student Succeeds Act (ESSA) with respect, in particular, to English language learners. Interesting read. We of course know that we can't imagine race/racism away. We have to work at it. Ideally, it interrogates white, middle class privilege. And it overlaps with other forms of subordination and oppression related to gender, sexual orientation, class, documentation status, and so on. It's institutional, individual, and historical. It's a multi-faceted problem. And there's ample scholarship to provide guidance in this regard—literally decades worth of research, writing, and publishing in this area of race and ethnic relations, multicultural education, and beyond. Millennials will benefit best and most from ethnic studies as a new default in public education—and about which I have already written, alongside vast, numerous others that similarly opine. Jamelle Bouie, Slate’s chief political correspondent. Very interesting research by UCLA bioinformatician Steve Horvath. Thanks to Dr. Rudy Acuña for sharing. Horvath emphasized that Latinos’ slower aging rate cannot be explained by lifestyle factors such as diet, socioeconomic status, education or obesity, because researchers adjusted for the influence of such factors. Further worthy of note is the finding of beyond the age of 85 for African Americans, their lifespans tend to be longer than comparable whites. Barring the ravaging effects of colonization (for example, read this illuminating piece that advocates for food sovereignty for Native Americans in the U.S.), to this I would add that "sharing ancestry" is a living, breathing thing, too, since Mexican Americans and others that emanate from Central and South America often eat an ancestral diet. Every time we eat a corn (not flour) taco, that's an indigenous meal. The whole planet can thusly benefit from this diet and I encourage everyone to read this book titled, Decolonize your Diet by Luz Calvo and Catriona Rueda Esquibel, and to also check out this website for more resources on how to do this. I personally try to consume nopales or nopalitos (cactus) regularly. I use the small, tender leaves from my cactus in my garden to regularly make jugo verde (green juice) that you can read about here. One of the ingredients, parsley, is also a natural teeth whitener. I notice my teeth whiten with regular use. Hope folks find this helpful. I'm making me a jugo verde today! A new way to measure how humans age suggests that Latino Americans withstand life’s wear and tear better than non-Latino whites — and that they may have their Native American ancestors to thank for their longer lives. To get a handle on some of these thorny issues, UCLA bioinformatician Steve Horvath and his colleagues have been trying to devise a biological clock that measures age more comprehensively than simply counting up birthdays. Their method reflects the activity level of the epigenome, the set of signals that prompt one’s genes to change their function across a lifespan in response to new demands. This “epigenetic clock” captures a key feature of aging: that as we grow older, there are complex but predictable changes in the rate at which our genes are switched on and off. Good News out of California! As we mentioned earlier this week, if passed, AB2016 will create a model A-G approved Ethnic Studies Curriculum that school districts can adopt, and would be the first of its kind in the entire country! Check out an earlier post on this on my blog. 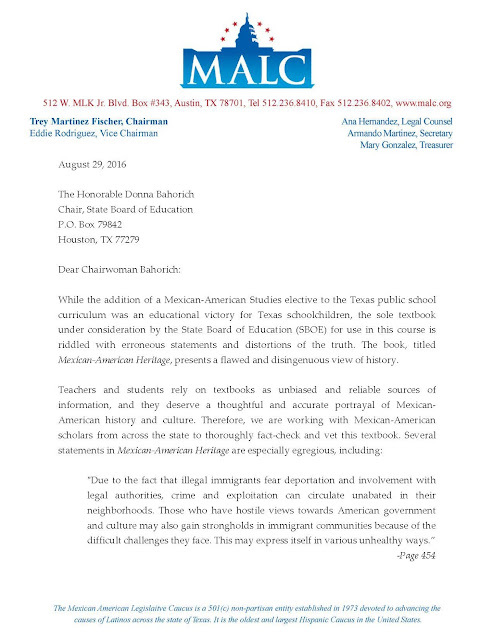 The lawsuit was filed on Mallika Das’ behalf by the Organization of Chinese Americans-Greater Houston, a nonprofit that seeks to improve the social, political and economic well-being of Asian-Americans and Pacific-Americans. Das, however, died before the case could be completed, but Pitman rejected state lawyers’ request to dismiss the lawsuit, ruling that the organization had standing to continue in her place. Pitman also ordered the state to pay the organization’s legal fees and court costs. Go to this website for the actual, downloadable report recently out of the National Conference of State Legislatures (NCSL). The U.S. workforce, widely acknowledged to be the best educated in the world half a century ago, is now among the least well-educated in the world, according to recent studies. At this pace, we will struggle to compete economically against even developing nations, and our children will struggle to find jobs in the global economy. States have found little success. Recent reforms have underperformed because of silver bullet strategies and piecemeal approaches. Meanwhile, high-performing countries implement policies and practices and build comprehensive systems that look drastically different from ours, leading them to the success that has eluded states. Pockets of improvement in a few districts or states is not enough to retain our country’s global competitiveness. The good news is, by studying these other high-performing systems, we are discovering what seems to work. Common elements are present in nearly every world-class education system, including a strong early education system, a reimagined and professionalized teacher workforce, robust career and technical education programs, and a comprehensive, aligned system of education. These elements are not found in the U.S. in a consistent, well-designed manner as they are found in high performers. We have the ability to turn things around. Much higher-performing, yet less-developed countries—such as Poland and Singapore—have made significant progress developing their education systems in just a decade or two because they felt a strong sense of urgency. 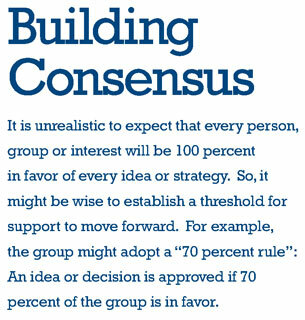 Build an inclusive team and set priorities. Study and learn from top performers. Create a shared statewide vision. Get started on one piece. We must directly face these challenges and begin immediately to reimagine and re-engineer our own education system. We must implement meaningful and comprehensive changes that will produce real results for our students. State legislators must lead this work. Education is first and foremost a state responsibility. Each state can develop its own strategies for building a modern education system that is globally competitive, similar to the approach taken by other high-performing countries. But we must begin now. There’s no time to lose. 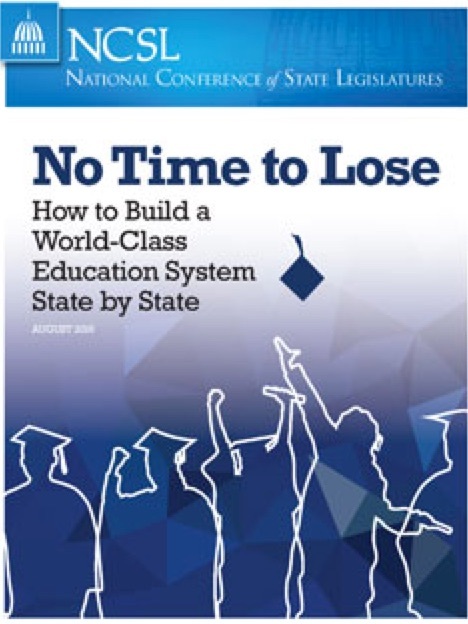 A media event was held Aug. 9 at the 2016 NCSL Legislative Summit to release “No Time to Lose: How to Build a World-Class Education System State by State” to the media. The National Conference of State Legislatures hosted a plenary session during its 2013 Fall Forum to discuss the results of the Organisation for Economic Co-operation and Development’s (OECD) most recent survey of what 15-year-olds in industrialized countries could demonstrate about their knowledge of reading, mathematics and science. This survey is known as the Programme for International Student Assessment (PISA). 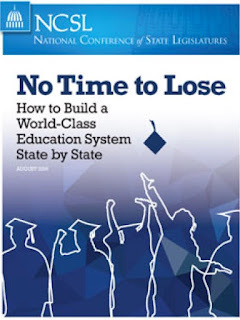 Upon hearing of the disappointing performance of students in the U.S., officers of NCSL’s Standing Committee on Education requested that NCSL launch a legislative study into international comparisons of high-performing education systems. They wanted to study other high-performing countries to learn which policies and practices were in place and what lessons the U.S. and individual states might learn from their success. They also wanted to learn about the consequences for our economy and quality of life if we failed to improve our standing. A bipartisan group of 28 veteran legislators and legislative staff, along with several partners from the private sector, began an 18-month study in 2014. They focused on the highest performing countries on PISA to discover commonalities across their policies and practices. They met with education leaders from these countries, along with national and international experts who study their systems. They also visited several countries to see the differences firsthand. Just came across this wonderful history lesson on Tejano music by the late Selena Quintanilla herself. Listen to Part I and then go to Part II to see the remaining part of her presentation (scroll down to my other blog post this morning). I am happy to see she got excellent advice on this by people whose work I know and respect, including Dr. Olga Najera Ramirez, Dr. Manuel Peña, and Abel Salas. On so many levels—and of course, especially for her family—her senseless death at the tender age of 24 when she was murdered is profoundly tragic. Dreaming of You, the crossover album Selena had been working on at the time of her death, was released in July 1995. It sold 175,000 copies on the day of its release in the U.S.—a then-record for a female vocalist—and sold 331,000 copies its first week. Selena became the third female artist to sell over 300,000 units in one week, after Janet Jackson and Mariah Carey. It debuted at number one on the U.S. Billboard 200 chart, becoming the first album by a Hispanic artist to do so. Dreaming of You helped Selena to become the first solo artist to debut a posthumous album at number one. The recording was among the top-ten best-selling debuts for a musician, and was the best-selling debut by a female act. Dreaming of You joined five of Selena's studio albums on the Billboard 200 chart simultaneously, making Selena the first female artist in Billboard history to do so. The album was certified 35x platinum by the RIAA, for shipping more than 3.5 million copies in the U.S. alone. As of 2015, the recording has sold five million copies worldwide, becoming the best-selling Latin album of all-time in the United States. In 2008, Joey Guerra of the Houston Chronicle said its lead single, "I Could Fall in Love", had "made the Tejano goddess a posthumous crossover star". Her death was believed to have sparked an interest in Latin music by people who were unaware of its existence. It was also believed her death "open[ed] the doors" to other Latin musicians such as Jennifer Lopez, Ricky Martin, and Shakira. Our Tejana music legend, our own Tejana "candle in the wind," your death remains as wildly absurd today as is was the day that it happened on March 31, 1995. 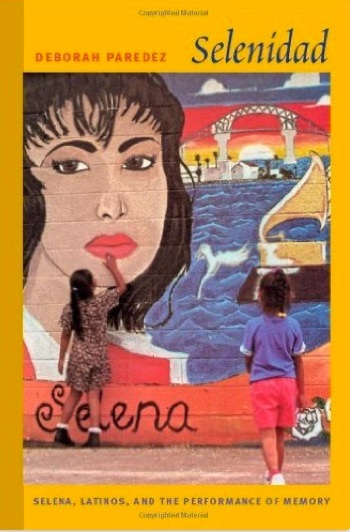 We miss you, Selena, but are thankful for your many legacies, including this lesson on Tejano/a music and its roots and influences, rightfully positioning it as a contribution to our world's musical heritage. 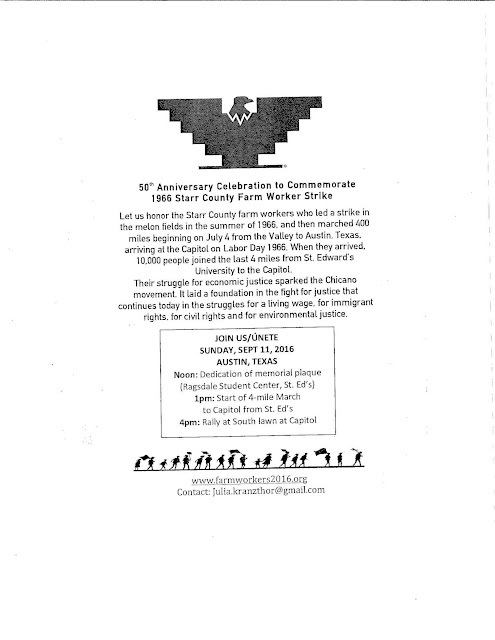 Consider attending a day of festivities (see flyer below) that commemorates the 50th anniversary of the 1966 Farm Workers Strike and March, which sparked the Mexican American Civil Rights (a.k.a. Chicana/o) Movement in Texas. Taking place on Sunday, September 11th at 1PM, there will be a program at St. Edwards University in Austin, Texas. The group that has assembled at 1pm will march to the Capitol. The program at the Capitol beings at 4pm. You can help by spreading the word to students, college and university faculty statewide, as well as to your personal networks. 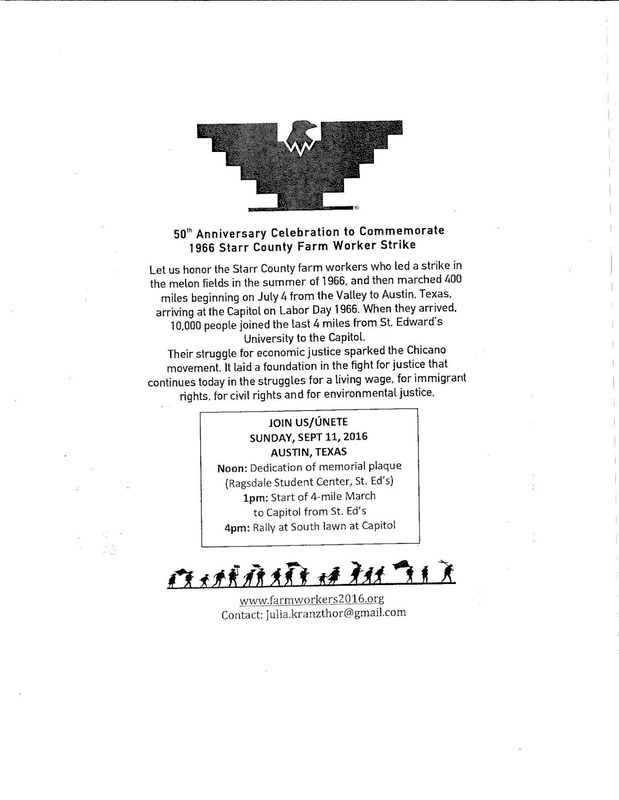 For additional information, contact: Julia Kranzthor <julia.kranzthor@gmail.com> You may also go to farmworkers2016.org for more information, including newspaper articles, photos and other data useful to teachers, students, and the general public. This is very exciting! Will try my best to make it! Help us share our new text - Growing Critically Conscious Teachers - and promote the broader Grow Your Own Teacher movement before a global audience at South by Southwest—SXSWedu 2017. To support our work: Create a PanelPicker account, and then Vote for our proposal. The public voting period begins today—August 8, 2016. Sadly, the same is often true for "innovation" within human resources, where market-based ideologies promote "efficiencies" that actually increase barriers between caring, committed, and critically conscious applicants within our communities, and school district hiring managers (Principals, HR Staff). However, within the SXSWedu conference, there are categories for both equality and leadership, and we plan to "share research and case studies that outline how innovative school districts disrupt traditional hiring practices to recruit and retain highly qualified, diverse teachers eager to embrace critical and culturally relevant pedagogies." Please promote this important session, and hopefully you will be able to join us during Spring Break 2017 as we share this important research with a global audience of influential educators. Thanks to EPP Doctoral student, Michael Barnes, for suggesting this together with this great under 2-minute presentation that I encourage you to listen to. National Latino/a Education Research and Policy Project (NLERAP [pronounced "Nel-rap"]), the organization that originated this Grow-Your-Own Latina and Latino teacher education pipeline.